As I was browsing through the different kinds of seafood in the wet market, I was considering what dishes I would be preparing for my family that evening. Interestingly, what caught my eyes was right at the end of the seafood stall: a tray of stingray which looked so fresh and inviting. I immediately decided there and then that I will cook this Teochew Spicy Stingray dish instead of the Sambal Stingray on Banana Leaf. Indeed, this dish brought back a lot of my childhood memories… I can vividly remember that my mum will cook this dish, as well as other dishes, to go with our Teochew plain porridge. This dish is also common in stalls where they sell Teochew Porridge. While cooking the dish, the aroma was very irresistible and I kept telling my daughter, it was like what “Ma Ma” used to cook. Oops, so nostalgic!! 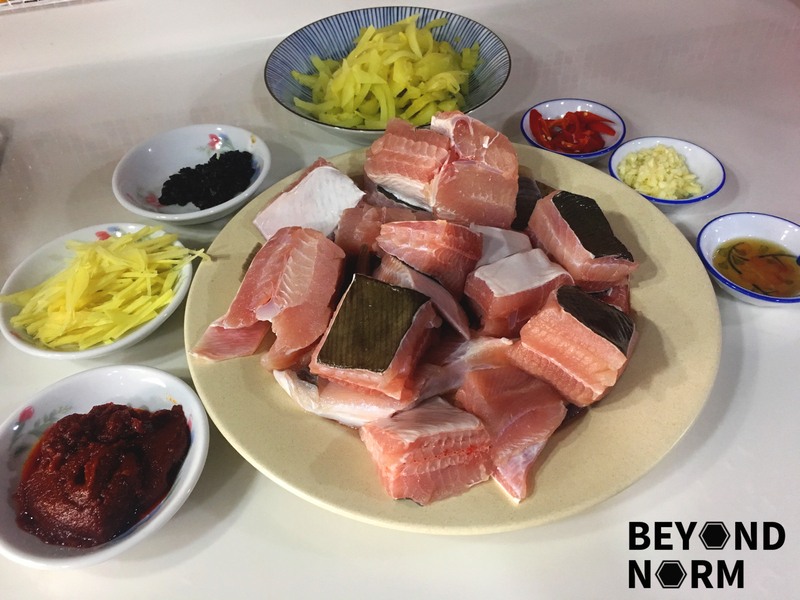 Cooking for my family is interesting… My daughter’s spiciness tolerance level is low while my son’s level is high, so I need to do a balancing act so that everyone can enjoy this dish. Hope you like this dish as much as us and give us some comments or feedback via our blog. We would also like to welcome you to join our Mummy’s Kitchen Facebook Group for food lovers, whether you are newbies or veterans. You can like us on Beyond Norm’s Facebook Page and subscribe to our blog and Instagram @beyondnormblog to get the latest updates. If you love videos subscribe to our YouTube channel @beyondnormblog. Use 3 tablespoons of salt and rub it all over the stingray. Then rinse off the salt. Cut the stingray into chunks and set aside. Soak the salted vegetables for about 10 to 20 minutes (depending on the saltiness of the vegetables). Then rinse and cut it into strips and set aside. Rinse the fermented black soybean and then roughly mash or chop. Set aside. Peel off the skin from the ginger and cut it into strips. Then set aside. Peel off the skin from the garlic and mince it. Then set aside. Rinse and deseed the chilli. Cut the chilli and set aside. Add in the ginger and garlic. Stir fry till fragrant. Add in the fermented black soybean and salted vegetables, then stir fry for a minute. 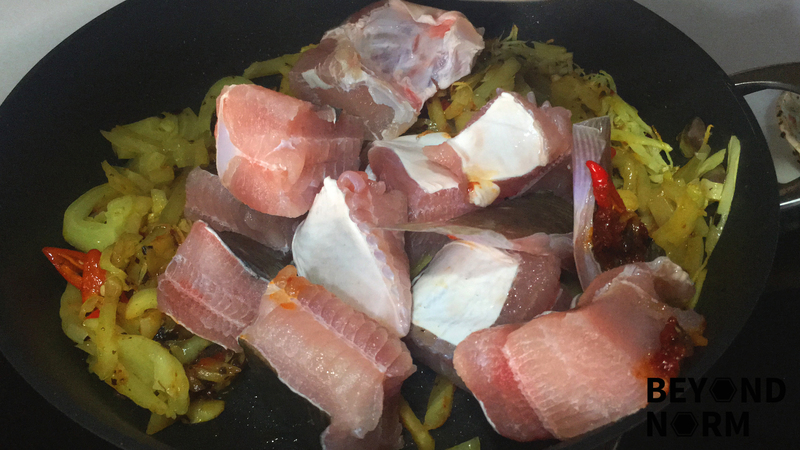 Add the cut chilli, sambal chilli and fish sauce. Stir fry for another ½ a minute. Add in the stingray and mix well. Add water and cover with a lid. Leave to simmer for 10 to 15 minutes or till the fish is cooked through. Serve with plain porridge or steamed rice. I only added 1 tablespoon of sambal chilli but our conclusion is to add more sambal chilli to enhance the flavour of this dish. As some salted vegetables are saltier than others, you might want to add the fish sauce only according to your taste. My children are not a fan of Chinese parsley so I added coriander and spring onion instead. Originally, Chinese parsley is used to enhance the flavour of the dish.